Holidays between sea and forest in a charming little house. Located between a wild sandy beach and a wonderfull forest. Great for people who love nature. Near Honfleur and Deauville. We had a great week here. The house was comfortable and the owners very friendly. The beach is a short 5 mins walk down a country path and is very quiet - usually not more than a dozen others to share the large expanse of sand, but sometimes, particularly in late afternoon, we had the whole beach to ourselves. We had pleasant evening meals in the garden at the front of the house. Honfleur is a lovely town too and well placed for trips to other Normandy beaches. A very nice house for a family vacation situated in a quiet spot surrounded by a beautiful garden. You can walk to a deserted beach perfect for sandcastles, long walks etc. The location is within a few minutes by car to Honfleur and convenient to other sights in the region as well as all the shopping you will need. And the owners are extremely nice and helpful, and have plenty of ideas for excursions. Wunderbar ruhig gelegene Ferienwohnung in Strandnähe, geschmackvoll eingerichtet und mit allem Nötigen ausgestattet um einen entspannten Urlaub auf dem Land zu verbringen. Der schön angelegte große Garten ist eine Augenweide. Und dennoch ist man in kürzester Zeit im quirligen Honfleur, Trouville und Deauville oder im Pays d'Auge oder, oder ........ Wir haben unseren Aufenthalt sehr genossen und uns sehr wohlgefühlt! Ein herzliches Dankeschön an die Vermieter! Comfortable holiday home , beautifully decorated, neat and clean , well equipped, friendly owner. Large and very quiet beach is nearby (100m steps along quiet country road ) . Our children had a great time on their "private beach". You can walk along the beach to Honfleur ( 3.5km) . Very well situated to explore Normandy. Highly recommended ! We stayed at la mare aux loups for a week in August and enjoyed a wonderfully relaxing holiday. The cottage is clean and well equipped and conveniently situated to visit Normandy's many attractions. The owners were personable and friendly and I wouldn't hesitate in recommending this accommodation. "Have just spent 8 nights here and had a wonderful time. The property was in excellent condition, very clean with all amenities in perfect working order. We had one small issue with the TV, but on saying it to the owners it was resolved immediately. The location was great, less than 5 minutes walk to the beach (which we had to ourselves most days) and only minutes from Honfleur. It is in a very quiet town, so noise was never an issue. Overall it was a great property and we would definitely recommend it." The apartment La Mare aux Loups is located in a romantic property between a sandy beach situated in a protected area and a beautiful forest (both 2 minutes walk). It is very quiet. 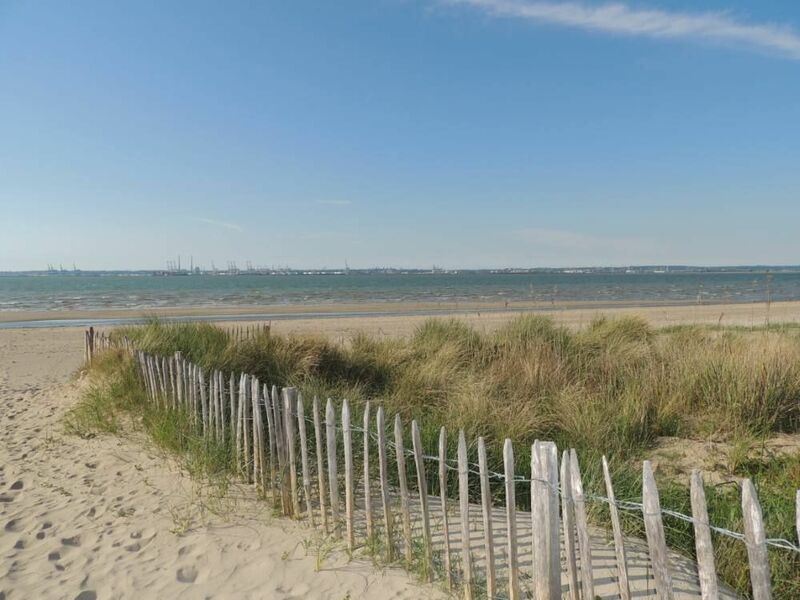 Here you can profit of the calm and Nature or many tourist attractions of Honfleur and Deauville. Pennedepie is a little village situated between Honfleur (4km) romantic and historical fisher village and Deauville (10km) the well-known seaside resort of the Côte Fleurie. The are many castles or Manors to visit as well as the historical landing beaches. For kids there exist a few fun parks. For the epicureans you have the French cuisine Normandy-style with its rawmilkproducts like crème fraîche and various cheeses, Fresh fish and seafood. Presalted lamb and beef. And last but not least the wellknown Calvados and Cidre. Welcome in paradise on earth and we wish very nice holidays. How to find us. Take the motorway until Honfleur, in Honfleur follow the Direction of Naturospace on the seaside (D513), continue on the D513 after the Vasouy townhouse (mairie)there comes a Pubrestaurant on the left side and after ca.400 meters on the right side after the house 'cap au large' there is a green metal open gate there you turn right and you're arrived. Welcome to the Mare ax Loups.